The Nick Jr. Favorites: Happy Halloween is on sale for $6.99 at Walmart.com right now. This would be a fun DVD for the kids to watch this month with some of their favorite Nick characters! Trick or Treat? It's always a treat to celebrate Halloween with your Nickelodeon Friends! Halloween is a special time of year and this DVD has all your favorite Nickelodeon shows as they discover candy, costumes, and haunted happenings! 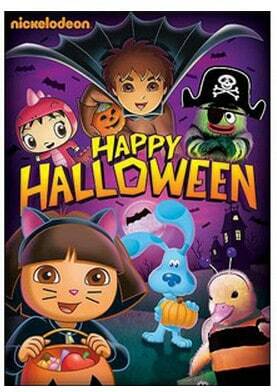 This year, celebrate Halloween with Dora, Diego, the Wonder Pets, Yo Gabba Gabba, Blue's Clues and Kai-lan all together on one DVD.